i just finished the reading of your book, and found everything very interesting. I was womdering though if the same principles described in the book could be applied for 1×2 markets. In the specific, analyzing 1×2 data for 5 seasons, extrapolate means and deviation for everyone of them and adjusting the final results with the help of cluster tables build for this type of results. It seems to me that the very same approach could give quite satisfying results, please correct me if i’m wrong.Also i have a question regarding the building of cluster tables. Once i split the clusters into four quartiles based on the HO/AO quotient, how do i figure out the range of odds associated with every quartile? I hope my question is clear anough. Also, when do you plan to release new volumes of the series? I hope you will find the time to answer all of my questions. The 1×2 markets are more difficult because there are 3 results instead of just 2. The over/under markets are simply speaking just Yes or No. However, you are right, statistics are statistics. It’s all about means and deviations, plus for the HDA betting about the inflection points. Regarding your question about the range of odds… Please have a look in the Cluster Table “Betting Tables” tab. There you will find in the columns D and E the average home odds for each cluster. If this is not enough then you will have to produce you own little table. The next volume of the series is going to be predicting 1×2 results, and I really hope that in January/February I will find the time to write this new volume. By the way, would you mind to write up a testimonial on the course and post it here on the comment section? We need to increase sales so that we can employ (and pay) someone to assist us to publish this book as a hard copy to be sold on Amazon & Co.
Ah, I have the old course, the first edition. Didn’t realise there was a new version out. I think what I’m looking for is actually explained in the footnote. Profit = investment * value. Sorry should have looked closer! Could you please explain how you calculated profit/loss for both back and lay bets in table 12? Fig. 12: The back and lay odds in the table are taken from the Betfair screenshot (Fig. 11). I cannot see there any profit/loss calculations. Are we talking about the same course? Another question concerning value. In the course you seem to favour comparing the Yield to the RSD, however when I look at my calculations I find it far easier (and more intuitive, but that’s personal) to just compare the market odds with the high fair odds based on the probability range. Is that perfectly fine as well? Or am I missing some nuance that makes the Yield method more favourable? Hi Stan, there are many roads which lead to Rome. I’m explaining the Yield/RSD comparison in the course, but if you have another method which works fine for you, then there is nothing wrong with using it. Question C ii) asks after how many bets the longest winning streak can be expected. However the answer for that question is how long the longest winning streak lasts. Two different things. The longest winning streak at 20% and 500 bets is expected to be 4 bets in a row. Using the calculations before that would mean that it is expected to take 625 bets at a hitrate of 20% to hit a streak of 4. Thanks for pointing out this little slip, we will make sure that when we revise the course we will provide the correct answer to this question. Feel free to continue pointing out whatever you find as we are planning to revise the course in November to remove any errors, doesn’t matter how tiny they are. Another question: on page 69 you mention ‘Consistency with statistics is of vital importance’ with regards to using an unbroken chain of 25 matches, however, does this same principle apply to the H2H matches? Or can these be from any year as long as there are 6 or more in total? Of course, it would be better if you could get 6 consecutive matches, or even 10, but teams have the habit of dropping out of a league and coming back again. Therefore, just 6 (or more) from the last 10 years is enough. There isn’t a way round it. Thanks! And just to make sure – if a team has dropped out of a league 1 season due to degradation and got back in the next, would this render all future statistical analysis useless due to the break? Following the ‘consistency’ mantra seems to suggest so…? Or, can I interpret the ‘consistency’ better by reading it as ‘never skip any available data’? May I know prerequirement to read this e-book? In order to keep this book down to a reasonable number of pages I have assumed that readers have had a little experience with statistics in the past. For example, you are familiar with terms such as ‘mean’ or ‘median’, can handle some graphs, and you may vaguely remember having seen a ‘distribution’. I have also anticipated that readers have a basic knowledge of mathematical operations and recognise signs used in algebra such as ‘x’, ‘y’, the summation sign, etc. Furthermore, I have assumed that the reader understands fundamentals such as finding the square root of a number, or squaring a number (or at least know where to find the right buttons to press on your calculator), and so on. But please don’t worry if you are challenged by maths or regard yourself as extremely rusty; I do explain things as thoroughly as possible as we go along. Of course, you’ll need a computer to read this PDF document, and having a calculation program such as Excel will certainly also help working through the exercises. I do not understand this part. please help. I bet when 10% value, 70% hit rates appear. I have seen many instances (betfair exchange) where a back bet shows 1 – 5 % value, but lay bets shows a much higher value, 20 to 30%. Is it true that lay bets usually holds more value than back bets? you cannot generalise that lay bets hold more value than back bets. It all really depends on the market price offered for the bet. Please continue working through the course, repeat the exercises, until you really understand everything. Probably four different times, I tried to jump ahead and not do some portion of the earlier exercises, because I was convinced I knew the probability calculations already. And even though I do, I found I really needed to just work through everything methodically if I really wanted to understand it. I bet other readers probably try to do the same thing! However, going through everything slowly and steadily, it is very well laid out and each piece builds on the next, just as it is intended to. Therefore, please, work and work and work through this course, and continue working. You may even have to repeat the exercises several times in order to understand everything. Please really work from the beginning to the end, don’t skip a single chapter. I’d like to know whether we can use the same stats and math to find value about 1X2? This course is the first of a series of books educating the ‘Fundamentals of Sports Betting’. There are more topics planned such as ‘Betting on Home, Draw, Away’, ‘Asian Handicap’, or ‘Betting In-Play’, and so on. Of course, it will take a while until all of these books have been written and published, but we reassure you that more course books are on their way. 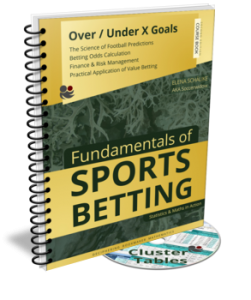 For the first volume we have chosen the Over/Under goal market because this is the easiest betting market to teach statistics and maths without the need to dive any further into much more advanced formulas and concepts. You will need a basic grounding before moving on to more complex calculations for bet types with multiple options such as 1×2, HT/FT and the Correct Score market. To answer your question… yes and no… The 1×2 market uses more or less the same stats and maths, but to reliable find value there is more to consider than explained in this Over/Under Goals course. MLS, Brazil and Japan has about 85 matches for quartile analysis. I have just done over 100 matches of quartile betting, total goal market with %CV adjustments. Unfortunately I have not successfully gain a positive yield. At the moment about -3% yield, 20 units fixed risk/gain staking plan. Would you mind to help me out? 1. I took historical odds statistics/results from Betexplorer. Their match result 1×2 odds is average bookmaker odds prior to match start. 2. The leagues that I’m currently betting are MLS, Brazil, Japan, Sweden, China and Denmark. Majority is MLS Brazil and Japan. Have I selected wrong leagues? So far hits and misses for all leagues except for Brazil. 3. I bet when 10% value, 70% hit rates appear. I have seen many instances where a back bet shows 1 – 5 % value, but lay bets shows a much higher value, 20 to 30%. Is it true that lay bets usually holds more value than back bets? 4. MLS brazil and japan has 85 matches of data, Sweden china and denmark has only 75, is 75 matches data enough? I wonder this affects my odd computations. 5. My spreadsheets will evenly divide data into 4 quartiles. Unlike what you have shown in your PDF where you divide them manually. Some 22 some 19. Do you think its ok? 6. I would like you to have a look at my spreadsheets and my betting records, if thats OK. Please advise. I really hope to bet for long term. Some leagues play statistically more reliable than others. Brazil definitely yes, Japan and China, no. It probably depends on their league format. But I cannot say that for sure. To you request to have a look at your spreadsheets… This is something I must unfortunately refuse. We have so much work that we don’t know what to do first; I cannot add anything more. Sorry! However, ask your questions here, and I’ll reply as much in detail as possible. Hey there why is japan not a good choice? I compare leagues with 5 years average relative deviation. is that good enough? focusing on any market which has 3.5% and below deviation. Japan may be a good choice or not. Truly, I don’t know. Each league follows different patterns. What applies to one league does not necessarily applies to another. We mainly concentrate on the EPL and Bundesliga, and what I can say for sure is, that Japan has different patterns to those two leagues. But is is impossible to know every league in and out. For everybody, also for us. Therefore, as you are probably more interested for the Asian leagues that for the Europeans, then there is no reason why not to specialise on them. Just be careful to ‘mix and match’ in an intelligent manner, not randomly. Stick to a few leagues, learn everything about them, and become a master. Came across your site. Found out you got a new course to offer. I am really interested and wondering if you do also bet based on what you teach in the course? Can I find any P/L records on your site? You will find an answer to your question in the article Frequently Asked Questions – Fundamentals of Sports Betting Course. Please scroll down to the bottom, you’ll find an answer to your question there. You may also be interested in the other ‘ethical’ questions asked by readers. I found the first course an invaluable insight into how the markets are priced and how things work, and will certainly be looking to add this updated edition to my collection. Everything I have purchased so far from Soccerwidow has been excellent and very good value and I would have no hesitation recommending the products to friends and family. What odds is considered value back bet? What odds is considered value lay bet? Is it the same for over and under market ? You only bought the course 2 days ago. It takes a genius to work through and completely understand the whole book in such a short period of time. Therefore, please work through the course from the beginning, do all the exercises, especially everything in part one, before you even look at part two (which is about betting though; I therefore understand that you probably read this part first and are now stuck) and then you will be able to answer your own question with great confidence. It’s a lot to learn, I appreciate this. But learning and comprehending takes time!